Filled with character, luxury and convenience, Sunny on Seaside is the ideal stay for families, friends and anyone else who wishes to experience the very best of Tybee beach vacations. Perfectly positioned on the southern portion of Tybee, you'll have streamlined access to the various restaurants and nightlife offerings within Tybee while simultaneously being within a few minutes from the historic Savannah squares. Of course, the true attraction of this Tybee vacation rentals is its proximity to the beach. As you rest in one of the three well-equipped bedrooms, close your eyes and allow the soothing sound of ocean waves drift you off to the land of dreams. Being roughly 75 yards from the beach, you're only a few minutes walk away from surf, sand and fun. There are few Tybee Island rentals capable of perfectly mixing city and beach amenities as well as Sunny on Seaside. Making your way down Butler Avenue, you'll turn onto a private street that's nestled away from the hustle-and-bustle of the more tourist-heavy regions within Tybee beach vacations. The perfectly positioned home features a welcoming exterior and ample parking for two vehicles. With manicured landscaping and quiet surroundings, the stresses of life will instantly begin to melt under the warm Tybee sun. Designed to the very last detail, Sunny on Seaside features a combination of inspirations. With hues of Morocco-inspired decor and splashes of oranges, yellow and reds, the interior decoration evokes style, sophistication and comfort. 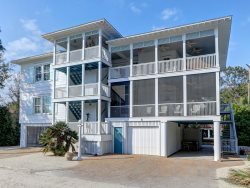 There are few Tybee Island rentals capable of perfectly combining a sense of luxury with comfort. Making your way through the entrance and up the non-ADA elevator, your eyes are instantly greeted to warm, welcoming colors and furniture. The living room features tile flooring, which is made more comfortable by a well-appointed Persian-style rug. The warm red-colored couch comfortably sits four to six persons while the solid wood entertainment center offers a color television for those days where you wish to soak in the company of good friends and a great movie. The sleeper-couch unfolds into a Queen-sized bed capable of comfortably sleeping two persons. Immediately off the living room, two sliding-glass doors beckon you off onto the balcony, which is the perfect area for your morning coffee or to unwind after a long day at the beach or exploring the various cultural activities in Savannah. The pleasant reverberations of ocean waves gently make its way throughout the balcony while the smell of salt water eases away all tension. There are few Tybee vacation rentals capable of delivering such atmosphere and beauty. The three bedrooms feature beautiful designs and ample sleeping for six. The master bedroom is outfitted with a King-sized bed and features luxurious views through its over-sized window. The attached bathroom is large enough to accommodate all your toiletries. The Queen bedroom suite features a queen-sized bed and ample room for your belongings. The third bedroom is the smallest in the condo and features two single-sized mattress. All bedrooms feature a private television and with Wi-Fi throughout the condo you can stay connected while enjoying the best Tybee has to offer. Each of the two bathrooms are well-appointed for genuine comfort and privacy. The open floor-plan of this Tybee vacation rental adds to the overall sensation of luxury. Upon entering the condo, you're greeted by an entertainment kitchen, which features two bar stools and a beautiful wood dining table with seating for four. Although you're within a few minutes from some of the finest dining options, our Tybee vacation rentals are outfitted with a smooth-top electric stove and over-the-range microwave. When compared to other Tybee Island rentals, Sunny on Seaside features a large kitchen capable of producing your favorite family meals. As an added touch, the recessed ceiling expands the height and sophistication of the kitchen. Of course, you'll only be spending a small portion of your time basking in the comfort of your well-equipped condo. What would Tybee beach vacations be without exploring the various cultural, entertainment and historical points of interest found in the immediate area? Want to explore the beauty of the best beaches this side of the Atlantic? You're only a five minute walk (0.3 miles) from Tybee Island Pier, which has been featured in a plethora of movies. Wish to walk among the most beautiful cemetery this side of the Mississippi? Famed Bonaventure Cemetery is only a 25 minute drive up US-80. No Tybee beach vacation is complete without a trip to Savannah. Explore the various sights, sounds and culinary adventures found along East Bay Street and in the Savannah Historic District, which is only a 30 minute drive from your front door. The most beautiful aspect of a Tybee beach vacation is the number of options at your disposal. With the ability to spend your entire vacation experiencing new adventures or simply digging your toes into the warm sand, there's no limit to your experience. Stop dreaming about a beautiful getaway, and book your stay at Sunny on Seaside for a vacation that's as unique as you are. Upon making a reservation with us, you will receive email confirmations instantly and be able to go directly to the property with no need to check in at our office as all of our homes have lockboxes with keys. The property was just as pictured. Very well decorated and comfortable. I would love to stay there again. We loved our visit to Tybee! This property was very spacious, comfortable and clean. It was perfect for our long weekend! Everyone I worked with was very professional. Loved the condo, hated to leave and come back to reality. The place was very clean & the location was the best part. The partial view of the ocean was great, anyone familiar with Tybee knows, normally you'd pay a lot more on Tybee for any view of the ocean. I prefer closer to the south end of the island but the short walk to the beach was great. All staff was friendly and a pleasure to work with. Everything was perfect. The weather was a little chilly. Enjoyed the great oceanviews from the bedrooms. Very close to the pier. Will be back next year. Very good. They were helpful in a lot of ways.